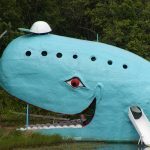 The National Park Service’s National Center for Preservation Technology and Training (NCPTT) will host a three-day symposium on the preservation of roadside architecture and attractions that are uniquely American. The symposium will focus on the preservation of these buildings and features that catered to tourists who traveled American roads during the 1920s-1970s. Learn more about the symposium here!